The Democrats have been in a sorry state for much of the last 2¹/₂ years, but lately they’ve become the sorry party. 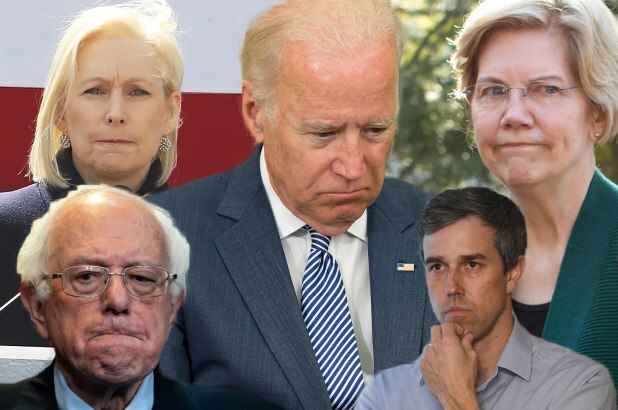 Elizabeth Warren, Kirsten Gillibrand, Bernie Sanders and Beto O’Rourke are all trying to apologize their way to the White House. Sanders has apologized for what an aide called “an entire wave of rotten sexual harassment” in his 2016 campaign. She also apologized for previously being “callous” about immigration, meaning that she used to be mindful of the political center before she started ranting about abolishing ICE. Warren apologized to Cherokees for pretending to be one of them for 60-something years (“I am sorry for furthering confusion on tribal sovereignty and tribal citizenship and harm that resulted.”). The Democrats’ skateboardin’ soyboy O’Rourke, who has castigated himself for taking advantage of his “white privilege,” has generated the most colorful apology headlines: “Beto O’Rourke apologizes for joke about wife, teenage murder fiction” — FoxNews.com; “ ‘Phenomenally large breasts and tight buttocks’: O’Rourke apologizes for 1991 review” — MySanAntonio.com. Biden, for his part, the not-yet-candidate who is struggling to get his campaign off the ground while smoke pours into the cockpit, has been issuing quasi-apologies not only for doing his job (questioning Anita Hill in her 1991 testimony) but also for “English jurisprudential culture — a white man’s culture. That’s got to change. It’s got to change,” he said. After making the mistake of calling History’s Greatest Monster, Mike Pence, a “decent guy,” he immediately reversed course: “There is nothing decent about being anti-LGBTQ,” he added. As for the stuff he really should apologize for, playing touchy-feely-sniffy-kissy-slurpy-slurpy with every woman who came within groping radius, he hasn’t yet said sorry. All he has done is pledge to do better next time and plead that times have changed since he was born. Which is a reminder that he was born in 1854. The contrast with the man all of these Democrats seek to replace as top dog is excruciatingly evident. President Trump has done a lot of things most would agree merits an apology, but then again you do project a certain aura of strength when you never back down from any dispute, no matter how trivial. At some point in most campaigns, voters get a jarring reminder that the world is a dangerous place and that toughness and confidence are more reassuring in a difficult moment than cringing, blanching and begging. The Democrats sometimes act as though they’re ashamed of their country. They can’t afford to seem as though they’re also ashamed of themselves.